The days are long but the years are short. This phrase is said to mothers all the time and it is totally true. Some days it feels like we will never make it to bedtime, but at the same time it feels like my almost four years of motherhood have passed by in the blink of an eye. As moms, we're usually pretty good about recording those big milestones - the first word, first step, first day of school. But what about those everyday moments that are so precious and so fleeting? Those hilarious things they say that make you laugh out loud, or those times that you're bursting with pride. You want to capture them all, but you just don't know how. The time my son ran up to me, threw his arms around me and said, "Mommy, you're my best girl." The time my son told me he liked me because "your hair is so soft and your eyes are so blinky." The time my twins snuggled up in their new big boy beds together to sleep. The time my more timid son finally made it to the top of the big slide on his own. I am so fortunate to be able to stay home with my kids, so I am privy to a million little moments and milestones as I've watched them grow. And as much as I like to think that I would never forget each one, I also know that I have already forgotten quite a few. I want to hold on to these precious days of early childhood, when my kids are filled with wonder and delight at everything in their world. But my mom brain, filled with a million things to do, worries, and plans is just plain tired and I can't hold it all. So I made a solution. 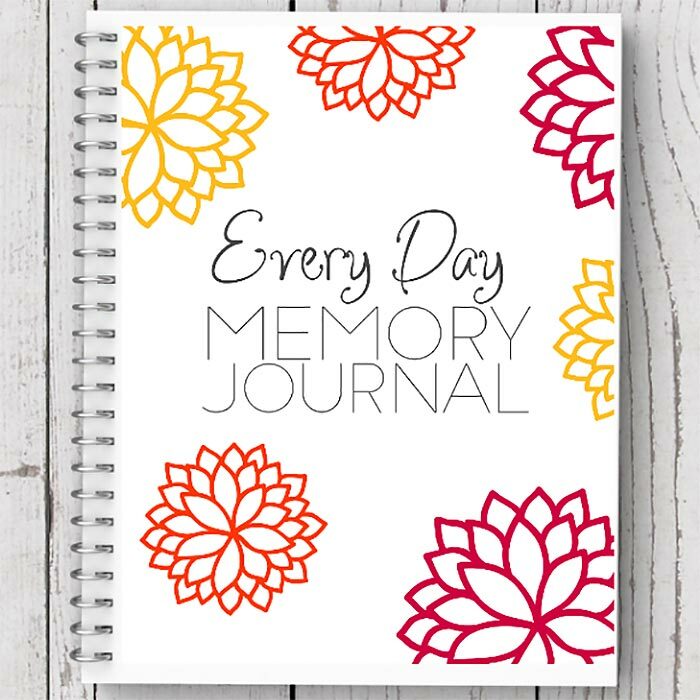 The Every Day Memory Journal is the perfect way to capture all those precious moments in just a few minutes every day. It has 16 pages in all and is undated, so you can start anytime you like and use it for years to come. Here's how it works. Start with these blank weekly and daily pages. 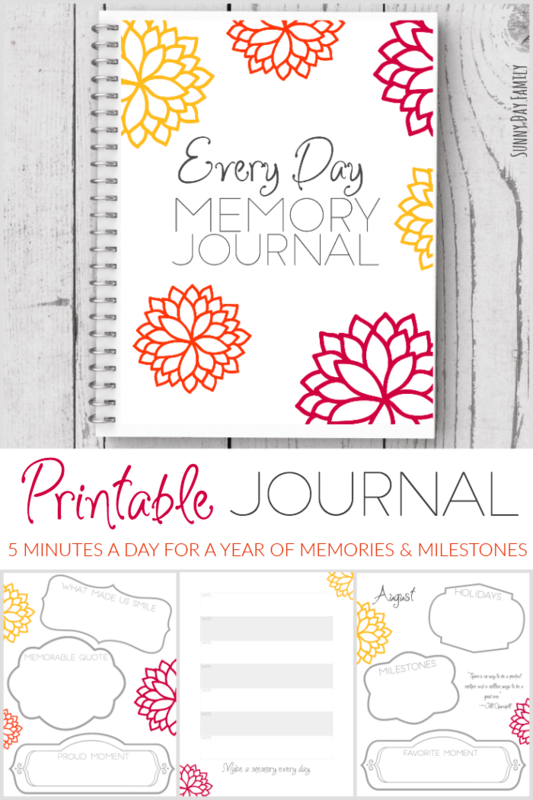 You'll have a page for recording each week's happy memories, memorable quotes, and proud moments. 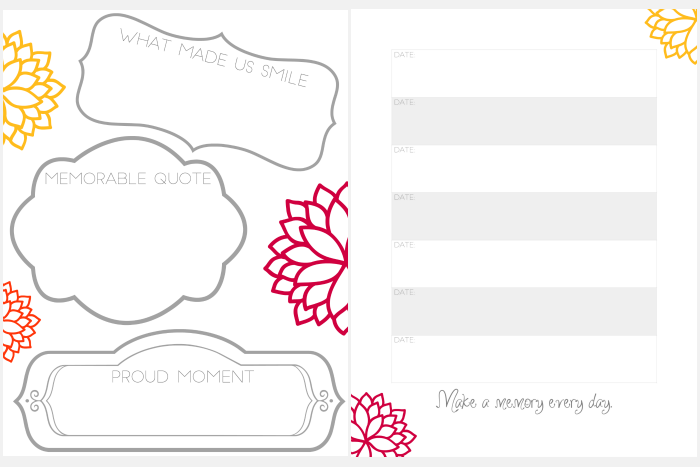 You'll also have a spot to record a quick memory for each day - anything that you don't want to forget. I write down funny things my kids say, a fun activity we did that day, anything goes! 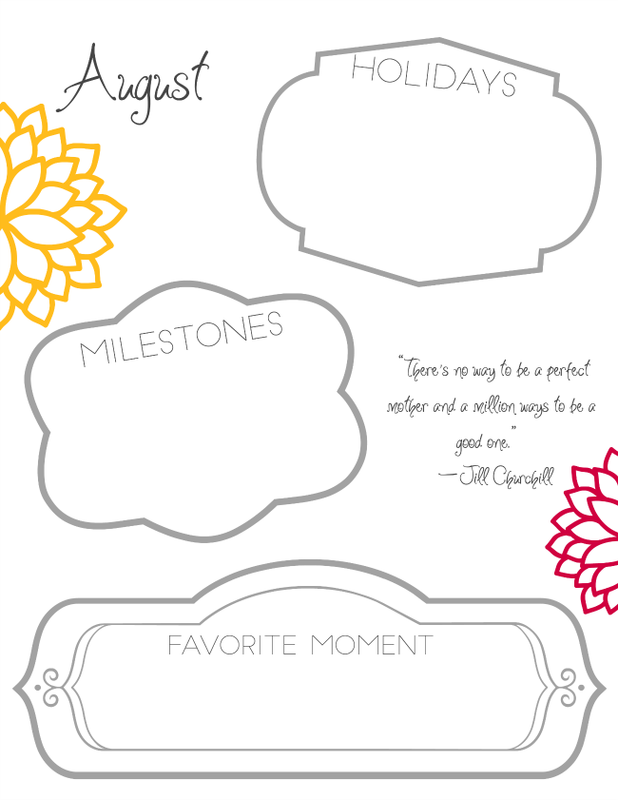 You'll also find a page for each month, to record milestones, holidays, and favorite moments. Plus an inspirational quote for each month too! Don't wait another day to start recording your memories - it just takes a few minutes every day for a lifetime of moments! These are just suggestions - feel free to put yours together any way that you'd like. You can have the journal spiral bound at your local copy shop, or place in a three ring binder. I printed the front and back covers of mine on cardstock, and used these paper fasteners to hold it together. Then I prettied up the edge with some washi tape for a totally personalized look. What are some of your every day memories? I'd love to hear about them! Send me a message on Facebook or leave a comment below and let me know.